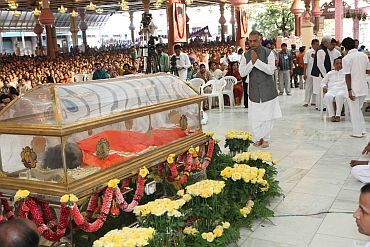 A living God for millions of devotees, Sathya Sai Baba who passed away on Sunday was laid to rest at the Sai Kulwant Hall in Puttaparthi, Andhra Pradesh amidst full state honours on Wednesday. 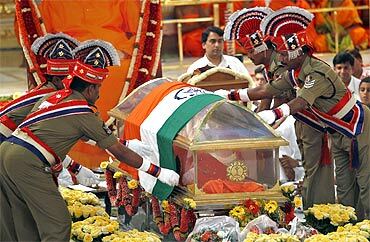 The final rites which were performed as per the Hindu customs commenced at around 9 am. Number nine was considered to be lucky for Baba. 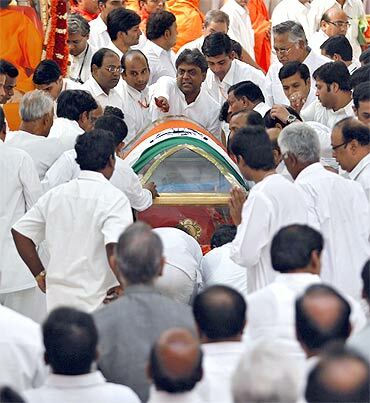 An 18 member team of priests conducted the last rites as per Hindu rituals. The 18 priests were led by Kandukoori Kondavadhani from Rajahmundry in Andhra Pradesh and they performed the process in Aagama Shastra. 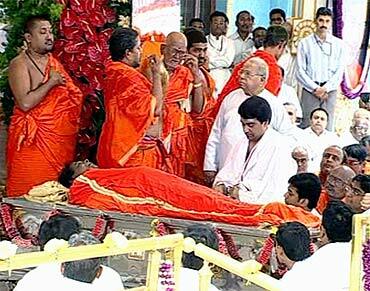 Baba's nephew Ratnakar, who sat next to the body, was seen performing the last rites. He appeared calm for a while, but broke down when performing the last rites. Sitting by his side was Satyajith, Baba's personal caregiver. The body of Baba was covered in an orange cloth at 9.40 am after the rituals were completed and his body lowered into his samadhi amidst chanting of Hindu mantras. The body was lowered into the pit which was later filled with Kurukshethra soil, salt, silver, gold and navaratnas. Water and soil from the Ganga, Jamuna, Cauvery, Godavari, Narmada and Sindhu were used in the ritual. The procedure of gifting of a cow (godana), donation of land (bhudana) and gifting of clothes (vastra dana) were also followed. Although the rituals were conducted as per the Hindu rights, priests from the Muslim community, Sikhs, Christians and Buddhists also conducted prayers at the Sai Kulwant Hall. 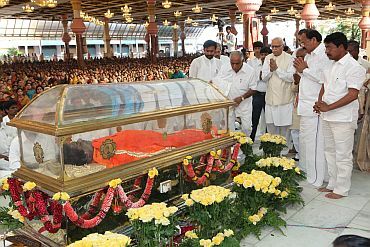 The funeral which was performed with full state honours witnessed important dignitaries, members of the trust, family members and also volunteers of Prashanthi Nilayam. The gun salute was accorded and the police band played in homage as the funeral proceedings were going on. Prepartions for the burial of Baba commenced on Tuesday itself. The pit which is 7 feet by 12 feet was dug out at the dais of the Sai Kulwant hall and Baba's body was lowered. The place is considered to be significant because over the past several decades, Baba gave darshan to his devotees from the very same place. Baba himself had expressed that he should be buried at the very same place since he felt closest to his devotees here. A memorial will now be constructed at the same place where Baba was buried. However this process would commence in the days to come. After the building of the samadhi, a golden statue of Sai Baba will be erected at the same place. Following the rituals, the general public will be allowed to have a glimpse of the Samadhi Mandir from 11.45 am for the next two days. Normal prayer and bhajan sessions would also resume in a couple of days after that. The scenes in Puttaparthi were emotional. 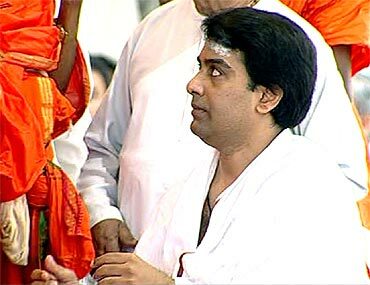 Devotees cried their hearts out while chanting the Sai mantra as Baba's body was lowered. It was a final good bye for them. 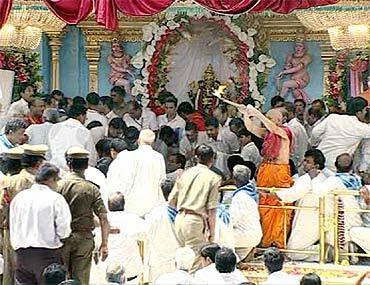 Giant screens were erected all across Puttaparthi so that the devotees could witness the final rites. The look on the faces of the devotees was that of a state of shock and the temple town is still coming to terms with the demise of their swami. Among the dignitaries present were Senior Bharatiya Janata Party leaders L K Advani and Venkaiah Naidu, former home minister Shivraj Patil, Karnataka CM B S Yeddyurappa, Andhra Pradesh CM Kiran Kumar Reddy, former CMs Chandrababu Naidu and Ashok Chavan among others.